EXCLUSIVE HACIENDAS OF MISSION HILLS with a WATER VIEW second to none!! FURNISHED 3/2 Stretched CHARLOTTE BUNGALOW Villa with an OVER SIZED 2 car garage and straight driveway, poured concrete construction with cement finish. BOND PAID, NO CARPET IN HOME. This Villa is BEAUTIFULLY DECORATED, a spacious kitchen with plenty of beautiful cabinets and QUARTZ COUNTER TOPS, tiled back splash and breakfast bar. 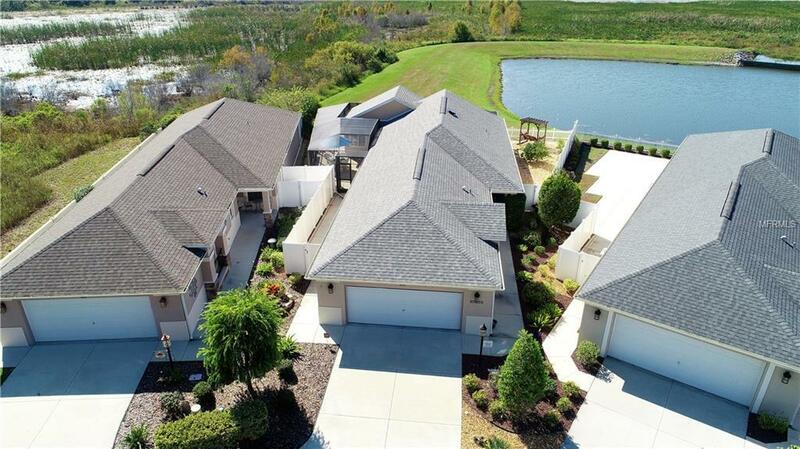 OPEN FLOOR PLAN, CROWN MOLDING, large dining area, sitting area and living room, FLORIDA ROOM WITH VAULTED BEAD BOARD CEILING and a MINI SPLIT AIR CONDITIONER with access to the beautiful courtyard with a wrap around birdcage. Spacious master bedroom with tray ceiling, walk in closet and an en suite bathroom with shower. Bedroom 2 with a vaulted ceiling and large closet, Bedroom 3 has a beautiful built in MURPHY BED AND room for an OFFICE. INDOOR LAUNDRY ROOM. YAMAHA Golf Cart is included. Close to Haciendas of Mission Hills Neighborhood Recreation Center and pool, Palmer Legends Country Club and Golf Course and Live Oaks Park. PLEASE WATCH OUR VIDEO OF THIS EXCLUSIVE PROPERTY.